Elizabeth Lauren Ownby and Matthew Malachi Cole were married July 21, 2018 in a 4:30 afternoon ceremony held at Highland Park Baptist Church with Stuart Henslee officiating. The reception followed at The Tuscumbia Depot and Roundhouse. The bride is the daughter of Terry and Laura Ownby of Muscle Shoals. She is the granddaughter of Shirley Reyer and the late Billy Reyer of Meridianville and the late Jack and Shirley Ownby of Florence. The groom is the son of Bubba and Annie Cole of Tuscumbia. He is the grandson of Luke and Leigh Gargis of Tuscumbia and Chap and Helen Osteen of Florence. 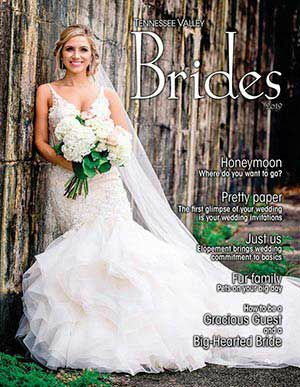 For her wedding, the bride chose a white satin Allure Mikado ballgown with an illusion back, covered in lace appliqués, purchased from Cherry Tree Lane in Florence. Maid of honor was Emily Ownby, sister of the bride. Bridesmaids were Meg McGuire, Allie Rose, Macy McCollister, Emily Woods, Savannah Clement, Katie Belue, Leya Franklin, Macy Trevillion, Anna Handley, Lexie Black, and Caroline Wells, all friends of the bride. Flower girl was Amily Cole, niece of the groom. Best man was the groom’s brother, Zach Cole. Groomsmen were Kyle Pendley, Max Beech, Ethan McCreary, Kyle Jefferson, Mason Carter, David Askew, all friends of the groom; Kirk Mears, brother-in-law of the groom; Chandler Sartain, cousin of the groom. Ring bearers were Braylon Cole and John Luke Mears, nephews of the groom. Wedding directors were Kara Sams and Denise Woods. Floral designer was Stephanie Crow. Music for the ceremony was provided by Mckenzie Lockhart, Kristen Dunn, and Max Beech. Caterer was Stacie Oliver, who also made the wedding and groom’s cakes. Hair stylist was Shawn Ayers from Halo Hair and make-up artist was Lauren Lindholm. Photographer was Hannah Busing of Gracemade Photography and videographer was Studio 318. Special thanks to Lyle and Linda Askew for allowing us to take pictures at the home on the bluff in Sheffield. The couple were given several showers before their nuptials: a shower at the home of Emily and Denise Woods, a shower hosted by the groom’s family, and a shower hosted by Highland Park Baptist Church. They were also treated to bridesmaid’s luncheon at the home of Pat and Mary Ann Stegall. After a honeymoon trip to the Dominican Republic, the couple is now residing in Mobile.